Kingdom: Animalia, Phylum: Chordata, Class: Sauropsida, Superorder: Sauropterygia, Order: Plesiosauria, Suborder: Plesiosauroidea, Family: Polycotylidae, Genus: Dolichorhynchops. From the studies and the researches carried it is evident that the Dloichorhynchops is an aquatic animal and it has four flips to swim in the water. It is believed that these animals are found in the cretaceous period. These are generally found in the rivers, lakes, oceans and swamps. The body structure of the Dolichorhynchops is like that of the body of the lizard. That is these look like in the shape of the lizard. These are generally believed as the sea serpents of the cretaceous period. These animals are characterized by the long head and short neck. IT is believed that these animals are not the fish; they have to breathe the air just like the dinosaur cousins. That it to respire these animals has to come to the surface of the water for respiration. This implies that these are the animals that are evolved from the terrestrial ancestors. 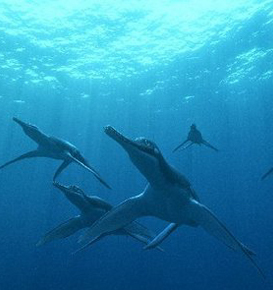 Many scientists believe that nothosaurs are the ancestors of these animals. These animals are bigger than their ancestors. That these animals have been evolved from the terrestrial ancestors and these developed their body size bigger than their ancestors. These animals are far from the aquatic reptiles of prehistoric times. These Dolichorhynchops look like the reptiles, but these are not the reptiles, these are evolved from the dinosaurs. During the late Jurassic and cretaceous period these animals were the bigger and stronger animals. The form and size of the skull and the lower jaws in these animals are similar to that of the Trinacromerum. The vertebral column of these animals is found to be nearly complete and most of the vertebrae are free from crushing and distortion. These have well-developed spinous processes and articulations. It has concave centra. And both the hind limbs in these animals are present and except the few terminal phalanges these are nearly complete. These exhibits strong and conspicuously developed articulating surfaces for muscle attachments. The humerus is like femur and exhibits strong and developed articulating surfaces for muscle attachments. The Dolichorhynchops are about 10- 17 feet long. And it is believed that these lived in the shores of North America . These Dolichorhynchops mainly depend on the soft bodied squids. These are characterized by having a large neck, snout is narrow and the teeth are small. Hope, you might have got the information required by you on Dolichorhynchops.